The Final Summit is about the story of David Ponder who is now 74 years old. Many years have passed since he discovered the Seven Decisions (If you are like me, have not read The Traveller's Gift before; but a good summary of the Seven Decisions can be found by clicking on the link provided. The summary of these seven decisions is also narrated in the first chapter of this book). Nonetheless, even though David Ponder was very wealthy, he was discouraged about life due to the fact that he had recently lost his wife, the love of his life. The angel Gabriel then appears and whisked him away to heaven for a final summit -- a project that he must solve before the time stipulated in movement of the sand in the hourglass. Together, with the team of his fellow travelers (comprising of wise and great men and women of the past), from Winston Churchill to George Washington Carver to Joan of Arc, he must work to discover the one solution that will save humanity. Whenever I read this book, the one imagination that I always picture in my mind, is that the scene of this drama is somewhat similar to the scenes from the live TV series, the Apprentice. A group of apprentice is given an assignment by the mentor (in this case, the angel Gabriel). The mentor walks out. The apprentice team come together and work out the answer. And when they are ready, the mentor is being called back and a spokeperson of the group presents the answer to the mentor. The catch in this story is, David Ponder and his team is only given five chances to come up with the accurate two-word answer to this question: what does humanity need to do to restore itself to the pathway toward successful civilization? As expected, David Ponder used up all five chances before he was able to come up with the answer. In their discussion on each of these five decisions, I learned much wisdom. 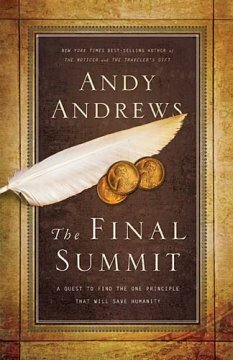 Indeed, as Chairman of Thomas Nelson, Michael Hyatt, said in his interview with Andy Andrews, this book is really choke full of wisdom, despite being a fictional book. There are so much truths, so much wisdom that we can learn from. There are certain books that I will never re-read; not for this one. This book will certainly goes to my reference shelf. Success is a journey. And that journey is founded on the principle of the path (adapted from Andy Stanley's book). The Principle of the Path says that direction, not intention, determines destination. And that destination for which we should strive is one of successful life, although not necessarily a life of success. To me, a successful life means that I am heading in a right direction. Yes, there may be setbacks along that direction, but these setbacks do not hinder me or causing me to re-navigate my direction to another direction. A successful life means to be able to utilize every experience that I have gone through - successes, failures, warts and all, as stepping stone for the next step. A life of success on the other hand, means having 'success' in everything that we do. We may not achieve a life of success, but it does not mean we cannot live a successful life. Hope sees what is invisible, feels what is intangible, and achieves what most consider impossible. People can take away everything that I have, but one thing I must not lose is hope. Hope is the very bedrock for perseverance. ....there are no hopeless situations, there are only people who have grown helpless about them. As long as I have breath, I must not lose hope, because the very fact that I am still breathing means that I have not fully accomplish the very purpose God has intended me to have on this earth. "...one of the reasons mankind has lost its way is our reliance on societal norm as life's blueprint. People have stopped questioning what the end result might be of certain actions and habits. We now rely on cultural trends - even celebrity behavior - to act as the compass guiding the decisions and behavior in our own lives." The very fact that we are seeking wisdom means that we are wise. "In seeking wisdom, thou art wise; in imagining that thou hast attained it, thou art a fool." The wisest folks I've been around weren't at all impressed with their own wisdom. The wise seem always to be on a search for wisdom. Experience is not always the best teacher for wisdom. We cannot possibly experience every experience in life in order to attain the wisdom of life. Rather, other people's experience is often the best teacher! The wise often have uncommon degree of common sense. Unfortunately, people often look for wisdom only when they have exhausted all other means. I believe everyone possesses the power to achieve whatever they wish. Many however, lack the courage to do so. But courage only genuinely appears when we are deeply passionate about the things or persons we care about. Because it is at that moment, we are willing to take risks that are beyond imagination in any context. The character angel Gabriel also appears to give a mini-lecture in chapter 8 on how very achievement of mankind is the source of humanity's egotistical nature and subsequent fallenness. "Pride goeth before a fall". "As humans, you think you are stronger than ever before. You worship your own intelligence. You've been to the moon and consider that a grand accomplishment, yet you are not clever enough to find the clues He left you about who made the moon in the first place!" Along with pride is the humanity's perverse attribution to its achievement to chance and randomness. I like the paragraph of the description on the cosmological facts and figures (although I have yet to verify its factuality myself). Chapter 9 is where Winston Churchill refers to his own depression as the "black dog". "The quality of one's answers can only be determined by the quality of one's questions. If you want good answers in your life, you must ask good questions." He goes on to say how on a daily basis our subconscious mind constantly processes the questions we ask ourselves. If we ask bad questions, our mind will descend to a state to produce bad answers. Winston Churchill said, "bad questions feed the black dog." The character Abraham Lincoln then gave an example: rather than asking "why can't I solve this problem....? ", ask "What is the best way to solve this problem....."
Ask questions like "What is the happiest, the fastest, the best way, etc, etc...."
This is the section where the character King David speaks the loudest. He exemplifies this quality - both when self-discipline is exercised (his practice with his slings before the showdown with Goliath) as well as when self-discipline is lacking (as with his temptation with Bathsheba). "It takes self-discipline to practice because practice is rarely exciting....Exerting self-discipline is merely a process by which you remember what you really want." Because this question will fuel our passion. This question will creates a strong desire within us to do something we don't particularly want to do in order to get a result that we would like to have. Character is what we really are in the dark. Nothing shows a person's character more than his habits. But character isn't something we are born with. Character is something we alone are responsible to build on the foundation of hope, wisdom, courage and self-discipline. While wisdom develops in quiet places, character is formed in the swirling storms that are the norms of the human life. As mentioned earlier in the book, adversity is often the preparation for greatness. Reputation is merely what others think we might be. Character is what we really are in the dark. After four unsuccessful attempts* to give the answer to the question: "what does humanity need to do to restore itself to the pathway toward successful civilization? ", David Ponder and team finally got it right. The answer is surprisingly simple, Do Something! This answer actually came out of nowhere, out of the desperation that they faced because of the extreme shortage of time. It was out of a sudden, somebody, somewhere, shouted the answer "Do something." It was the voice of Joshua Chamberlain. Joshua Chamberlain is also the subject of another Andy Andrew's book which I have read, "The Butterfly Effect." "...when one doesn't know what to do, he should do something. At that moment of panic or discouragement, one cannot do everything, but he can do something." "The question for each person to settle is not what he might do if he had the money, the influence, or the education, but 'What will a person do with the things he has?' To be discouraged about what you don't have is to waste what you do have." In my personal opinion, actually I do find it a little bit weird that the real answer to humanity is do something. It is not that I disagree with the argument that in the moment of desperation when we do not know what to do that we should do something, but the question is do what? Do something requires a definite action, it can swing to the positive, do good, or to the negative, do bad. In other words, I do find it a bit kind of anti-climax to the story. Overall, this book is a really good book to read and re-read. I have actually read it twice before writing this review. I conclude that Andy Andrews is certainly the C.S. Lewis of the 21st century. He is able to weave in so much wisdom in a narrative account. I will attempt to read his previous books, particularly on The Traveler's Gift.